You can define the percentage of GST for a particular price range or the cess amount per unit, in the stock master. 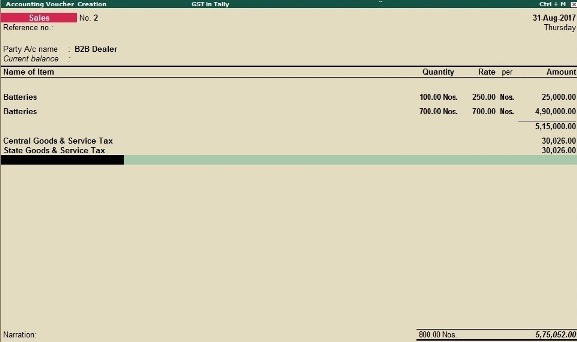 These rates will get applied while recording the purchase or sales of the stock items. 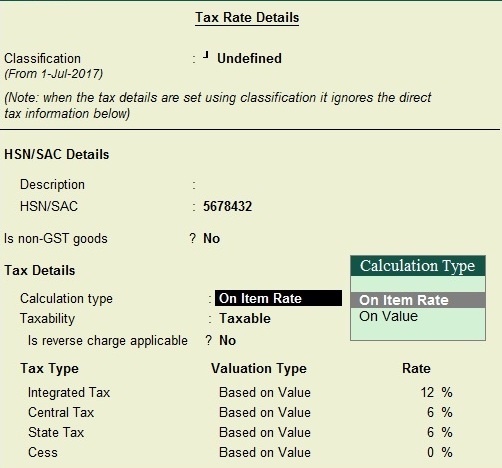 To configure the stock item for GST Calculation based on the slab rate of price range. Go to Gateway of Tally - Inventory Info - Stock Item - Create or Alter. Specify the required details in the field Name, Under and Units. Set the option GST Applicable to Yes. Specify the description and HSN/SAC. Select on Item Rate as the calculation type. Enter the price range under rate, and the percentage of Integrated Tax Rate. Press Enter or Ctrl + A to Save the details and again for save the Stock Item configuration. Now record a sales voucher for a stock item configured with GST on price range. Press Alt + A for tax analysis of the sales voucher. In above image you can see there is Stock Item Batteries have different GST Calculation. Because we define that if rate of item below 500 Rs. then IGST calculate @ 5% (2.5% CGST and 2.5% SGST) and if Rate is more than 500 then GST Rate will be 12% (6% CGST and 6% SGST).